Reinforced concrete is one of the most versatile building materials in the world. With proper design, quality control and maintenance, concrete structures can exhibit long term durability even in the most aggressive environments. There are many mechanisms that can contribute to concrete deterioration including freeze-thaw deterioration, salt scaling, salt crystallization, acid attack from chemicals or bacteria, sulfate exposure, alkali-aggregate reactivity, abrasion, erosion, cavitation, fire, and corrosion of embedded metals. Corrosion is a significant issue in many facilities. 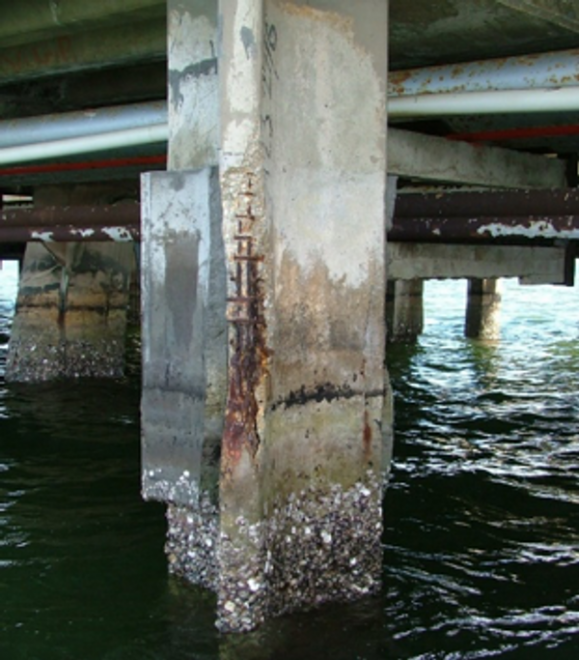 Corrosion is the primary cause of deterioration for structures exposed to the aggressive marine environments. Deteriorating concrete is evidenced by cracks, spalls, delaminations and rust stains. Over time, corrosion-related damage of concrete and steel can become a safety concern and a large contributor to rising maintenance cost and capital expenditures. It is estimated that the direct and indirect cost of corrosion to the US economy may be as high as 3 to 6% of gross domestic product. Maintaining and protecting structures from these deterioration mechanisms is a key aspect of concrete preservation. Repairs that do not address the cause of deterioration are doomed to fail in a relatively short amount of time. For example, concrete subject to acid exposure should be repaired and protected with coatings and linings that are designed for specific pH ranges. Once a structure starts to deteriorate, understanding the cause and magnitude of deterioration will aid in the implantation of repair and protection strategies that can extend the life and preserve structures for years to come, even under aggressive exposure conditions. The affected depth from the concrete surface can be readily shown by applying phenolphthalein, a white or pale yellow crystalline material. For use as an indicator it is dissolved in a suitable solvent such as isopropyl alcohol (isopropanol) in a 1% solution. 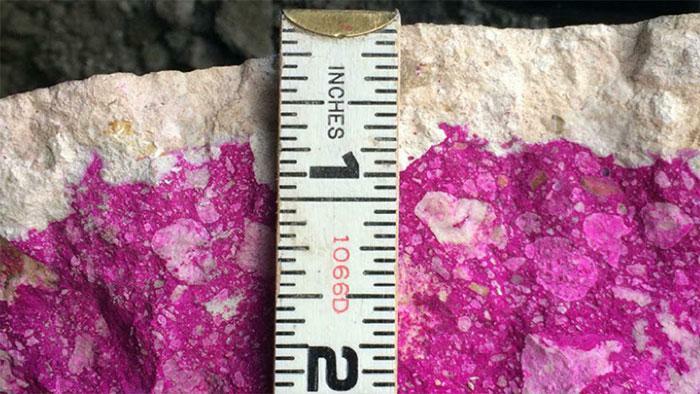 The phenolphthalein indicator solution is applied to a fresh fracture surface of concrete. If the indicator turns purple, the pH is above 8.6. If the solution remains colorless, the pH of the concrete is below 8.6 which suggests carbonation. A fully-carbonated paste has a pH of about 8.4. A professional condition survey that includes concrete and corrosion testing is essential. Understanding the cause and extent of deterioration requires a professional condition survey, including concrete and corrosion testing as appropriate. Typical investigations include visual and delamination surveys, removing concrete cores for compressive strength determination and petrographic examination, corrosion potential mapping, measuring the depth of concrete cover, and analyzing chloride profiles. 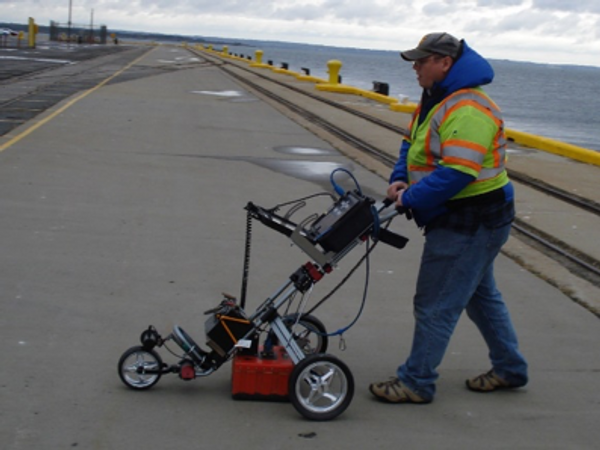 In addition to these basic tests, nondestructive testing using technologies such an impact echo, pulse velocity or ground penetrating radar can be used estimate the concrete thickness and locate deteriorated and cracked concrete. Similar technologies such pulse echo, parallel seismic or magnetic gradiometer testing are used to estimate the length of concrete, steel and timber piles. Once the cause of the corrosion and concrete deterioration has been determined, the owner’s budgetary and service life needs are incorporated into a final design and implementation of an appropriate preservation program. In addition to the basic tests listed above, professional concrete contractors can perform a number of corrosion evaluation methods, including non-destructive testing using technologies such an impact echo, pulse velocity and ground penetrating radar can be used estimate the concrete thickness, compressive strength and locate deteriorated and cracked concrete. 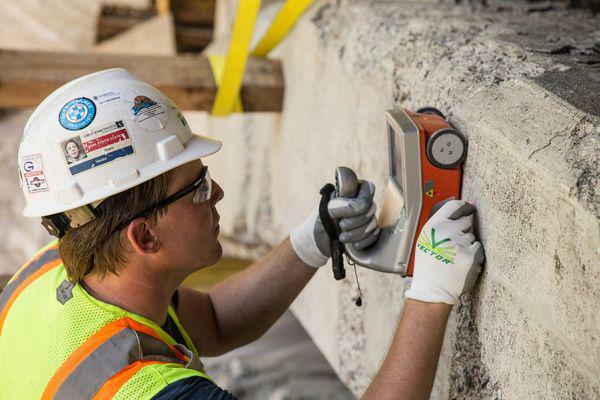 Similar technologies such pulse echo, parallel seismic, and magnetic gradiometer testing are used to estimate the length of concrete, steel and timber piles. Once the cause of the corrosion and concrete deterioration has been determined, a concrete construction company can ensure the owner’s budgetary and service life needs are incorporated into a final design and implement an appropriate preservation program. ACI Committee 222, Protection of Metals in Concrete Against Corrosion, ACI 222R-01, American Concrete Institute, Farmington Hills, Michigan. ACI Committee 228, Nondestructive Test Methods for Evaluation of Concrete in Structures, ACI 228.2R, American Concrete Institute, Farmington Hills, Michigan. ICRI Technical Committee 210, Guide for Nondestructive Evaluation Methods for Condition Assessment, Repair, and Performance Monitoring of Concrete Structures, ICRI 210.4-2009, International Concrete Repair Institute, St. Paul, MN. PCA, Concrete Information: Types and Causes of Deterioration, IS536, Portland Cement Association, Skokie, IL, 2002.